I’m in my second year at Nottingham Trent University studying for a BA (Hons) degree in Interior Architecture and so I’m currently looking for my third year work placement. When my tutor told me about the opportunity of work experience for Nottingham practice, Lungfish Architects, I jumped at the chance. Working with Lungfish Architects and as part of the whole Scape Group has given me an experience I’ll never forget. Right from the start I was made to feel really welcome which put me at ease. The design studio is part of an open plan office with people from across the group working in a busy but fairly relaxed atmosphere. Scape Group is a unique company in the way it operates but, at the same time, Lungfish also has its own distinctive culture so it’s like being part of one big family. During the two weeks I’ve spent with Lungfish, the knowledge and experience I’ve gained from being given the opportunity to work on live projects is invaluable. At my last work experience for an architectural practice, I was stuck in the photocopying room but it’s been a completely different experience for me working with the Lungfish team. Right from the start they took me on site visits, let me attend client meetings and asked me to work on design concepts on a wide range of current projects. Giving me the freedom to do this has boosted my confidence as well as gave me a true insight into how an architectural practice functions in the real world. I was even invited along to a fun night out bowling which really made me feel like part of the team. 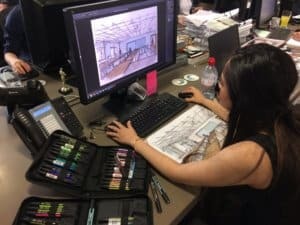 Being able to work in the industry has given me a true understanding of a working practice and has pushed me forward in the pursuit of the career I want as an Interior Architect. Being a part of Lungfish, even if for just two weeks, has both directed and supported me along this path and I will take this positive experience away with me for years to come.